Why Are Kelp Supplements Good for Skin? Home > Skin Supplements > Why Are Kelp Supplements Good for Skin? So what exactly is kelp, anyway? To be honest, it's just a fancy name for seaweed. But since the sea is the repository for all the minerals that have washed along the lands throughout time, kelp is especially rich in natural minerals and vitamins. That's why it has so many health-inducing properties, including being beneficial to the hair and skin. The Japanese have known it for years, now we know it too. Kelp can be good for you. In fact, algae, or kelp, is one of the most nutrient-rich life forms that we know, and as such is used in many shampoos, cosmetics, and other skin products. Kelp is harvested with a machine similar to a water lawn mower. It can then be turned into a gelatinous material called alginate, which is used as a thickener in ice cream, cosmetics etc. Sometimes it is dried, then used in Asian cuisine where it can be a garnish, or rehydrated and later added to soups and stews. Other times it is ground into a powder and sold as a nutritional supplement. Kelp contains as many as 70 important minerals and vitamins, including calcium, iodine, potassium, magnesium and iron. 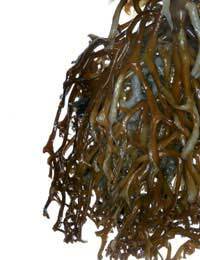 Most commonly, it is found in a number of species of brown seaweed called Laminaria. But because it is a good source of iodine, if you take too much it can interfere with normal thyroid function. Be aware that like many health supplements, the voiced benefits of kelp outweigh the actual benefits. Some manufacturers claim this natural seaweed can do everything from curing the herpes virus to stopping hair loss to suppressing the onset of HIV. Don't believe everything you read. Did you know that kelp plants can grow as much as two feet per day? Kelp forests are fantastic places in which to dive, due to the lustrous greenery as well as the array of marine animals that live within the seaweed itself. Special organic kelp supplements are available for dogs to help them keep a lustrous coat, as well as reduced shedding and a decrease in nervous energy. One advertises as being harvested from the world's “cleanest and richest” sea, the “unpolluted” waters around coastal Iceland. If your dog likes to drink from the toilet bowl, spend your money on something else! In 2007 a host of kelp natural supplements were found to contain dangerous levels of arsenic, and were responsible for some long-term users to experience nausea, vomiting, and memory and hair loss. These symptoms disappeared when they stopped taking the kelp. As the supplement industry is not well regulated, always be sure you buy any natural of health supplement from a reputable supplier, and read the label carefully. Don't skimp when it comes to brands, and always consult your doctor before taking any health supplement.